I’m a slack friend. I know that’s a pretty big opening statement, but lately (as in the past few months) it’s true. I forget to respond to text messages and then remember in the middle of the night that I need to respond or ring someone and arrange a catch up. Thankfully I’m not the only one, with many of my friends who also have little ones or are also ‘in the trenches’ who feel exactly the same way and sometimes we can go weeks/months without seeing each other. So when the stars align and we find ourselves available at the same time, we jump at the chance to see each other and catch up. A couple of weeks ago a good friend who I haven’t seen for months was over my side of town and called to let me know she would be dropping by. After a mad scramble to make the house look semi presentable (meaning I threw all the clothes/toys/books/paper/crayons into the play room and shut the door) I had enough time to think about making some morning tea for both my friend and I as well as all of our boys to enjoy. 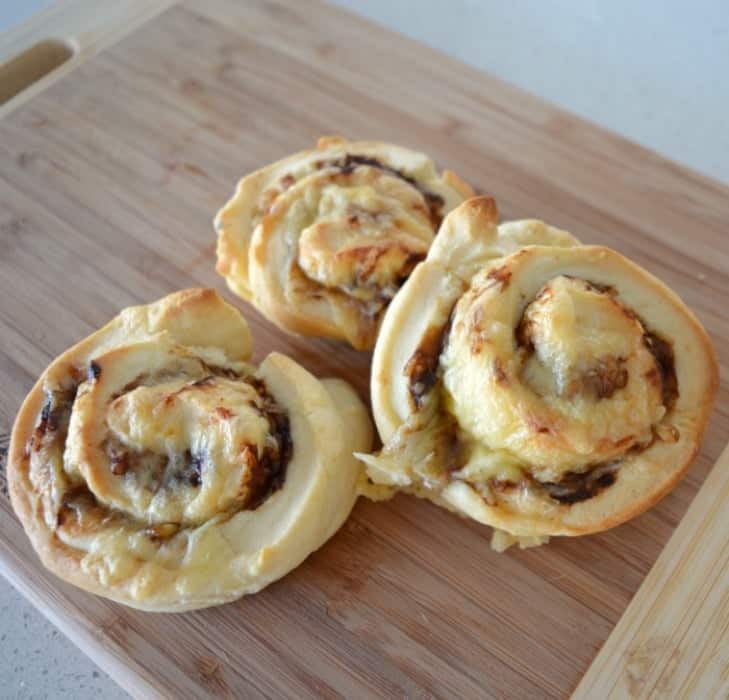 I decided to turn to my favourite no yeast scroll recipe, and since we had no inspiring ingredients in the fridge, I made do with the classic combination of Vegemite and cheese. 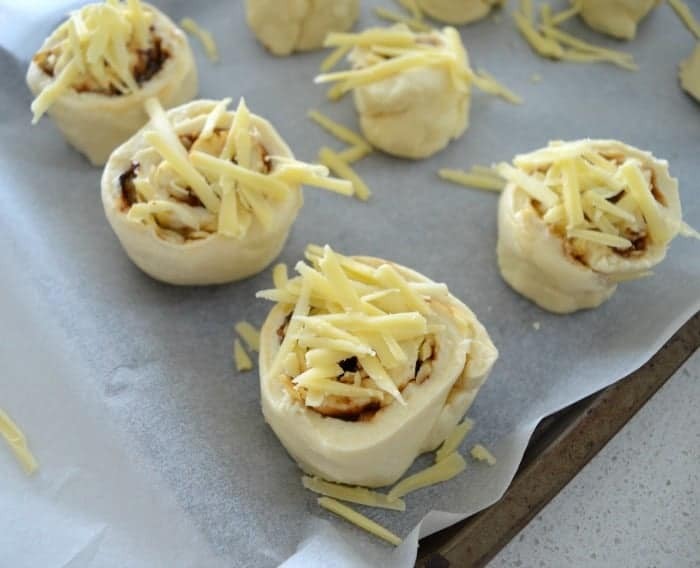 The Vegemite and Cheese Scrolls honestly took less than 20 minutes to put together and were well on their way to be cooked by the time my friend arrived. In between the tears, fights and tantrums from the kids, we managed to sit down with a cup of tea and have a chat by ourselves – all whilst we enjoyed one of these scrolls each. We both loved them and given the kids came back for seconds, I think it’s fair to say these were a hit. At the end of our visit, we promised each other it wouldn’t be long until we got together again – especially if it means we can enjoy more of these scrolls! Preheat your oven to 210 degrees and line an oven tray with baking paper. Sift flour and salt together in a large bowl and rub in the butter until the mixture is the consistency of bread crumbs. Slowly add the milk and use a butter knife to combine.Turn out the dough and knead until it forms a smooth ball. Use a rolling pin to roll dough out until you have a 30 x 40cm rectangle. Spread the vegemite over the dough, leaving a 2cm gap around the edges. Brush one long edge with a little bit of milk. Scatter approximately 1 1/4 cups of cheese over the vegemite. Starting at the long side (without milk) carefully roll the dough until enclosed. Cut into 12 slices – approximately 2cm thick. Place on a baking tray and sprinkle with the remaining grated cheese. Bake in oven for 25 minutes or until golden brown on top and cooked through. 1. Preheat your oven to 210 degrees and line an oven tray with baking paper. 2. Place the flour, butter and salt into the Thermomix bowl and mix for 10 seconds on speed 9 until mixture is the same consistency as bread crumbs. 3. Add the milk and mix for 7 seconds on speed 4 to combine. 5. Turn the dough out onto a floured bench and using a rolling pin, roll the dough out until you have a 30cm x 40cm rectangle. 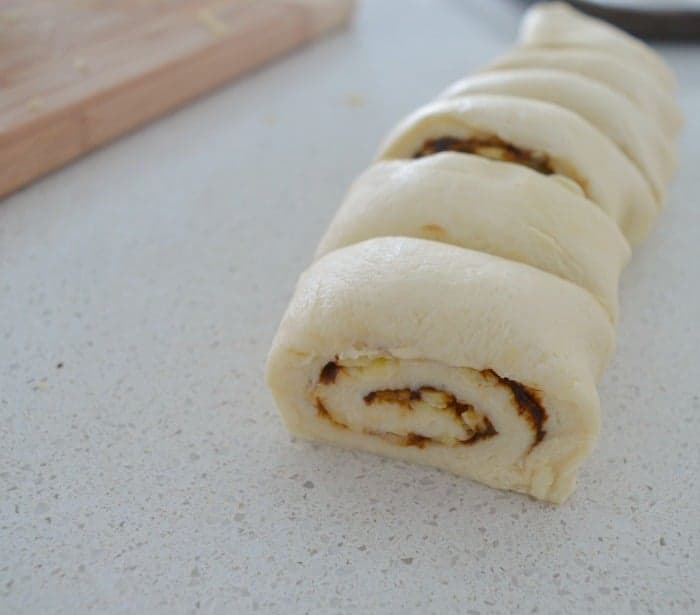 6.Spread the vegemite over the dough, leaving a 2cm gap around the edges. 7. Brush one long edge with a little bit of milk. 8. Scatter approximately 1 1/4 cups of cheese over the vegemite. 9. Starting at the long side (without milk) carefully roll the dough until enclosed. 10. Cut into 12 slices – approximately 2cm thick. 11. Place on a baking tray and sprinkle with the remaining grated cheese. 12. Bake in oven for 25 minutes or until golden brown on top and cooked through. Are you a slack friend too? What recipes do you like to make for last minute guests? Yum. 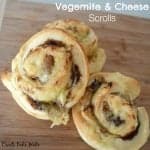 I made some cheese and vegemite scrolls the other day and my daughter’s loved them. A great alternative to sandwiches for the kids’ lunchboxes too. Yum we love the ones from Bakers Delight… I’m not much of a baker, but these look really easy, great for afternoon tea after school! They are SUPER easy Mandy, you will have to give them a go. These are are great, easy and filling for the kids. My 11yr old is growing at the moment and I can’t seem to fill him up.. so these are perfect and stops him craving for junk food. Sounds perfect Natalie. My boys are only 3 and almost 2 and I’m already worried about how I’m going to keep up with their appetites when they are older! Thankyou for another yummy recipe! And although I wish we didn’t go through it, I’m glad to hear I’m not the only one who has to child wrangle and deal with melt downs when catching up with friends! Sometimes I miss just sitting there and talking! Sitting and talking – what’s this strange and unfamiliar scenario you are talking about 😉 I just keep telling myself it will get easier – I hope! These look fantastic. My tornadoes love cheeseymite scrolls and I hate to think how much money I have spent at Bakers Delight over the last few years. Will be giving these a go – thanks! Haha, these will certainly save you some money! I so want to try these, but dough scares me a little. I think I’m going to have to take the big leap and try them this week. I know they’ll be a hit here too if I give them a go. I’m glad you had a chance to catch up with your friend. I know how hard it can be to find the time. Good friends understand when you’re busy. You will have to try these – you will nail them! 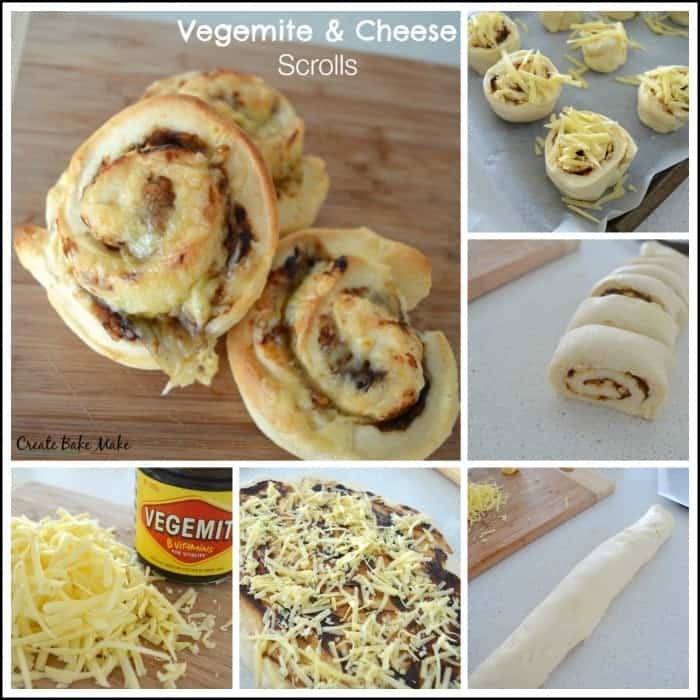 They sound yummy Bec, we love pizza scrolls here too. These look lovely and so quick and easy. I don’t have kids so can’t imagine how busy your life is but I try so hard to be an active friend. Trying to remember when special things are coming up for my friends and send messages ‘just because’. I’m obsessed with the vegemite scrolls from Baker’s Delight but yours look way better! Thank you so much for sharing the recipe, I’m definitely making those asap. Do you think I could make these with wholemeal sr flour? And would it be the same measurements do you know? This recipe looks great and so easy! Hi these look so yum! Just wondering if you know whether they freeze well or not? And whether freezing them before or after cooking would be best?? Thanks! Hi can you freeze these? ?